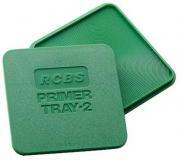 The Primer Tray 2 handles today s larger primer package quantities. The square shape makes it easier to handle. Grooved tray surface quickly positions primers anvil-side up.